State Incentive Evaluation Commission member Carlos Johnson questions consultants about proposed changes in business tax breaks. The consultants suggested retaining and fine-tuning most of the other business incentives they reviewed this year. The recommendations by the PFM Group of Philadelphia were presented Friday to the state’s new Incentive Evaluation Commission. They will be discussed at a public hearing on Nov. 10. The incentive panel intends to forward the proposals, along with any suggested changes, to Gov. Mary Fallin and state lawmakers by December for possible legislative action in 2017. For supporters of business tax breaks, PFM’s evaluations are likely to bring as much relief as remorse. Of the 11 incentives reviewed this year, the two recommended for repeal cost the state less than $1 million in fiscal year 2015, although more in previous years. The savings could be boosted substantially by suggested changes in other incentives, particularly the wind-power tax credit. That incentive has been growing rapidly in recent years and cost the state $113 million in fiscal year 2014. The PFM consultants suggested eliminating tax credit eligibility for new wind plants in 2018, three years sooner than currently planned, or imposing a hard cap to reduce annual outlays to an amount considered more acceptable to the state. 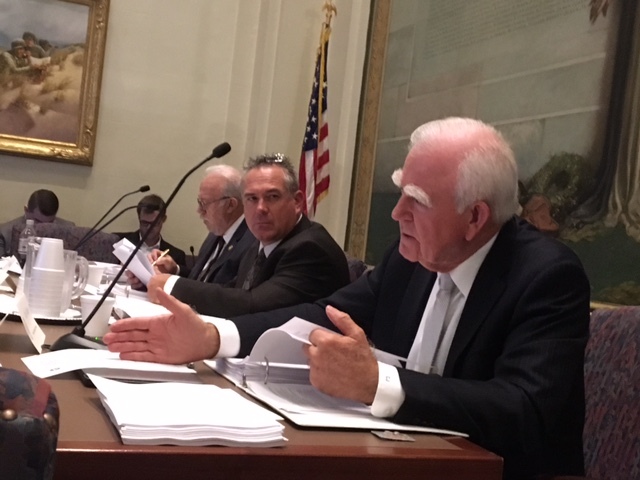 Former Iowa state budget director Randall Bauer, who is leading the PFM team in Oklahoma, said the state has already exceeded its original objective of helping the wind industry provide 15 percent of Oklahoma’s electricity output. Bauer warned that allowing the credit to continue to grow unchecked could endanger the state’s fiscal soundness. He said the cost appeared likely to exceed $100 million annually for many years to come. Still, the PFM group’s recommendations might disappointment tax break critics who hoped the reviews might help the state more quickly recover a significant portion of the hundreds of millions of dollars in tax revenue lost to incentives every year. Here are highlights of the PFM Group’s recommendations. Film Enhancement Rebate Program. The program provides cash rebates of up to $5 million a year to producers of movies and TV shows for work they do in Oklahoma. The rebates totaled $932,237 in fiscal year 2015. PFM recommended repealing the program because “there is no evidence that the Oklahoma film industry has strengthened” since its creation. Supporters of the program successfully resisted past efforts to eliminate it, saying it boosts Oklahoma’s image and provides indirect economic benefits to the state. Industrial Access Road Program. The 1970s-era incentive provides grants for construction or improvement of access roads to industrial facilities. It cost the state nothing in 2015 but about $2 million the previous year. PFM recommended repealing it because it found little evidence that the program played an influential role in business decisions and because it felt that it overlapped with other incentive programs. Ad Valorem Tax Exemption for Manufacturing. New or expanded manufacturing facilities are exempt from property taxes for five years. The incentive reduced tax collections by $68 million in FY 2015. PFM recommended keeping the incentive but applauded the Legislature’s decision to make wind power plants ineligible starting in 2017. It suggested other modifications to make the incentive more efficient but provided no estimate of the potential savings. Wind Power Tax Credit. One of the fastest-growing business incentives, the income tax credit for “wind-farm” electrical projects reduced state tax collections by $113 million in fiscal year 2014, the most recent year tallied by PFM. The consultants said Oklahoma appeared to benefit somewhat from cheaper electricity but noted that most of the benefit flowed to utility customers in other states. They recommended imposing an unspecified cap on annual credits or terminating eligibility before the currently scheduled sunset date of 2021. Historic Rehabilitation Tax Credit. The state credit, which matches a similar federal credit, reduces developers’ costs by 20 percent when renovating certified historic buildings such as Tulsa’s Mayo Hotel and Oklahoma City’s Skirvin Hotel. It cost the state $17 million in fiscal 2015. The consultants recommended that Oklahoma keep the program but place an unspecified dollar cap on annual costs. Aerospace Engineer Credits. The PFM group evaluated three related incentives that benefit new aerospace engineers in Oklahoma and the companies that hire them. Together, the three credits reduced state revenues by $7 million in fiscal year 2014. The consultants concluded that the programs were effective and were generating more money from overall tax collections than they cost. Other Incentives. PFM recommended keeping in place the Oklahoma Capital Investment Board until its scheduled sunset date of July 1, 2018. It suggested keeping an aircraft excise tax exemption but more precisely defining its policy objective. It advised retaining the Quality Events Incentive with minor modifications. The 11 business incentives evaluated this year comprise only the first of four rounds of initial evaluations by the consultants and the new state commission. Another 40 or so incentives are set for review in 2017, 2018 and 2019. Roggow told fellow commissioners he would like to complete this year’s work and forward recommendations to Fallin and the legislature by Thanksgiving.